If you are wondering, dear reader, why I didn’t post on last week’s assassinations, including beheadings, it was because I simply could not handle it. It’s no excuse, the campesinos in Aguán aren’t backing off. But sometimes even the secondhand trauma is too much. It’s one of those dilemmas of violence research- one’s own pain is voluntary, in a sense, and thus cannot be legitimately compared to the pain of those who are experiencing the evident, immediate trauma (except within a theoretical framework of a violence continuum, using a million caveats). But perhaps my twisted gut, this sense of nausea and impotence can provide some small insight, even thousands of miles away, into the terror embodied by those facing the barrels of Facussé’s assassins’ guns. We write here to inform you that we are being subjected to a smear campaign using false accusations of national and international NGOs. Said campaign has the aim of destroying over 50 years of work to provide Hondurans and Central Americans with products of the highest quality, investments in the billions of lempiras, the creation of more than 8,000 direct jobs, the generation of more than US$100 million in profits annually, and the creation of more than 100 thousand indirect jobs. The most recent campaign is aimed at blocking the certification of the company by the UN for the sale of carbon credits for the development and implementation of clean energy projects and projects for environmental conservation; to stop international financial institutions from financing our companies, thus putting at risk the investment so desperately needed by the country and finally to promote the boycott of our products. 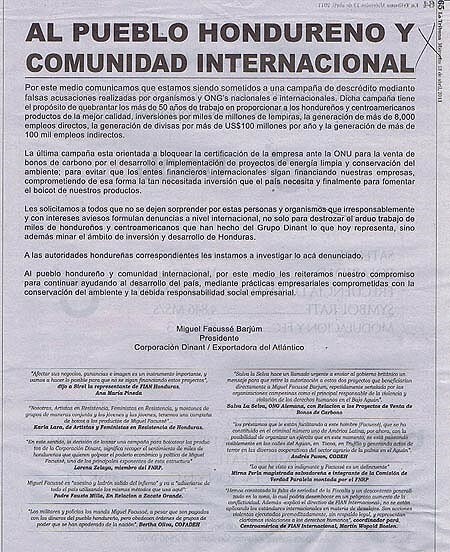 We ask you all to not be fooled by these people and groups that denounce us internationally irresponsibly and with sinister intent, not only with the aim of destroying the hard work of thousands of Hondurans and Central Americans in making the Dinant Group what it is today, but also of undermining the environment for investment and development in Honduras. We call upon the corresponding Honduran authorities to investigate what we have stated here. To the Honduran nation and international community, we reiterate here our commitment to continue helping the development of the country, through business practices committed to the conservation of the environment and through proper corporate social responsibility. “The soldiers and police are commanded by Miguel Facussé, despite the fact that they are paid by the Honduran people, but they obey the orders of the de facto powers that have taken control of the nation”. “Save the Rainforest makes an urgent call to send a message to the British government to withdraw authorization from these two projects that will directly benefit Miguel Facussé Barjum, repeatedly indicated by campesinos organizations to be the primary individual responsible for the violence and violation of human rights in the Bajo Aguán”. “the loans that are being provided to this man [Facussé], who has become the number one criminal in Latin America, for now, with the ability of mobilizing an army that at this moment, openly patrols the streets of the Aguán, in Tocoa and in Trujillo, carrying out acts of terror in the numerous cooperatives in the palm agrarian sector in the Aguán”. Central American coordinator of FIAN International, Martin Wopold Bosien. Quotha content by Adrienne Pine is licensed under a Creative Commons Attribution-Noncommercial-No Derivative Works 3.0 United States License.